It’s not even October yet, but I am getting super excited for Halloween. 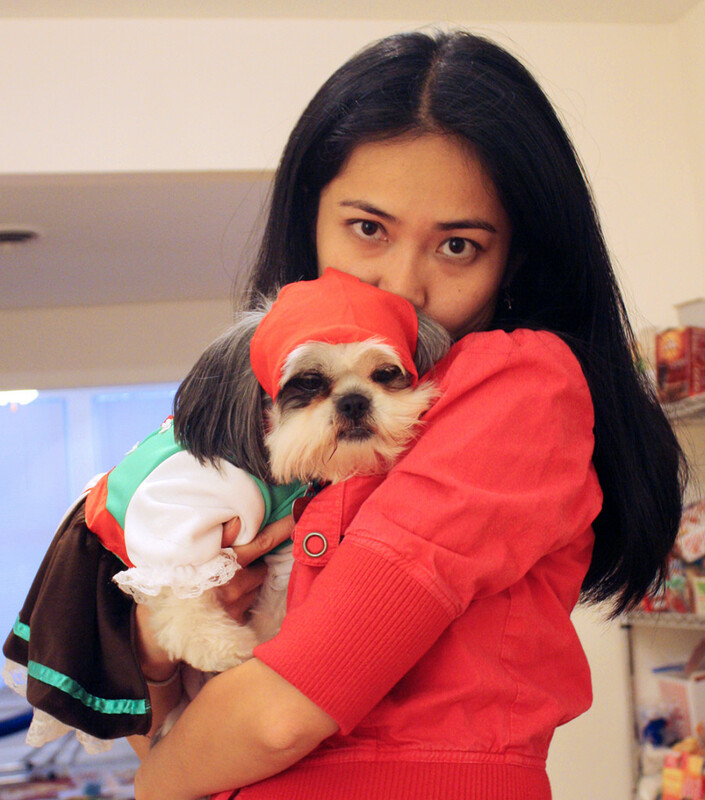 I LOVE getting dressed up … well, Mama loves to dress me up, and I just put up with it. And with Halloween coming up, it shouldn’t be a surprise that she would find me a costume! 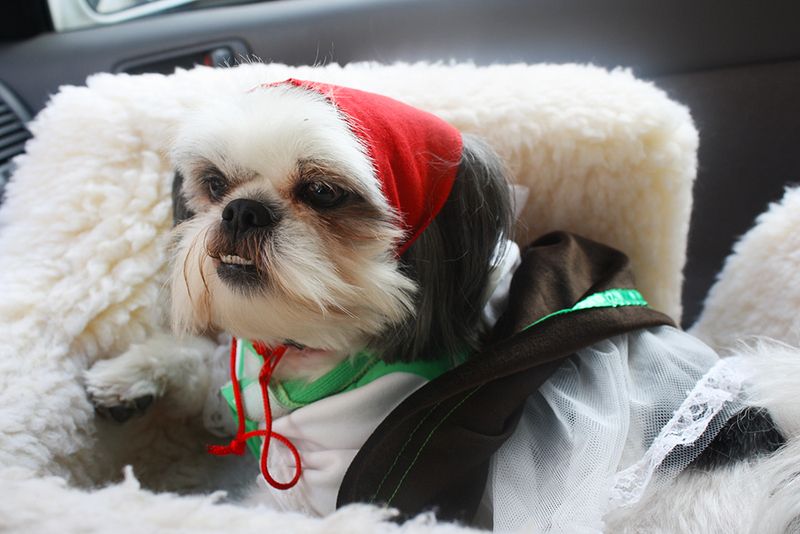 Luckily for her, the wonderful folks at Wayfair.com gave me THREE Halloween costumes! Can you believe it? We are super excited to show them all to you. 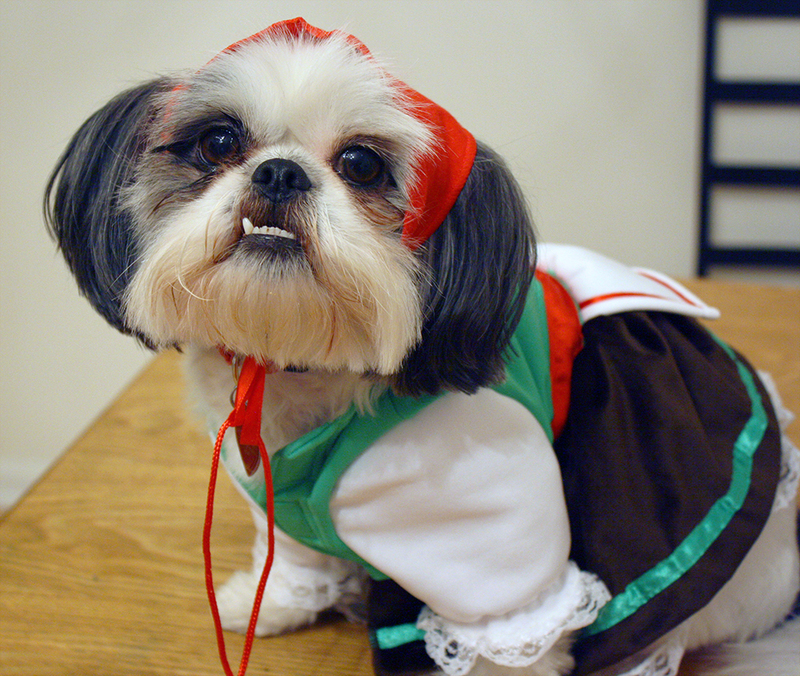 They are putting together a Facebook album of pets dressed up Halloween costumes. 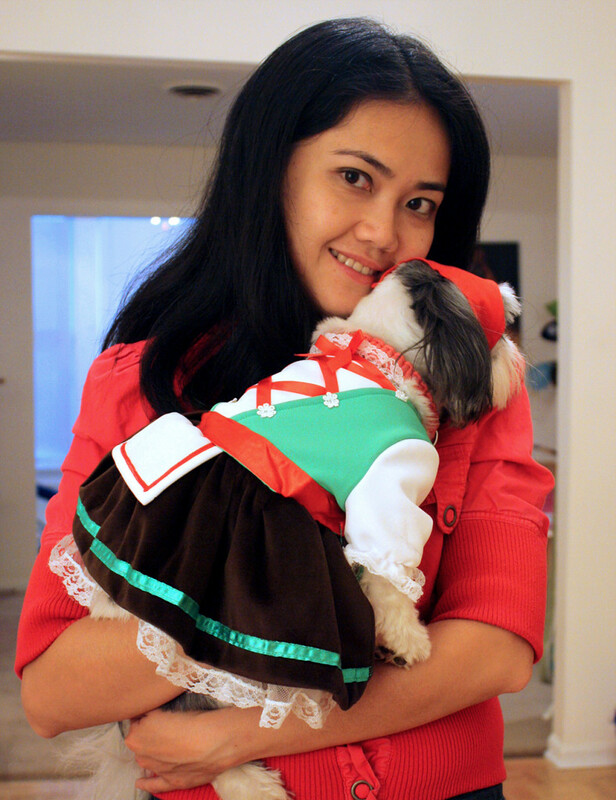 This is my first costume – Alpine Beer Girl! October Fest is coming up, so maybe I will wear this outfit in honor of all the beer drinking folks! If you want to buy the costume for yourself, here’s the link! 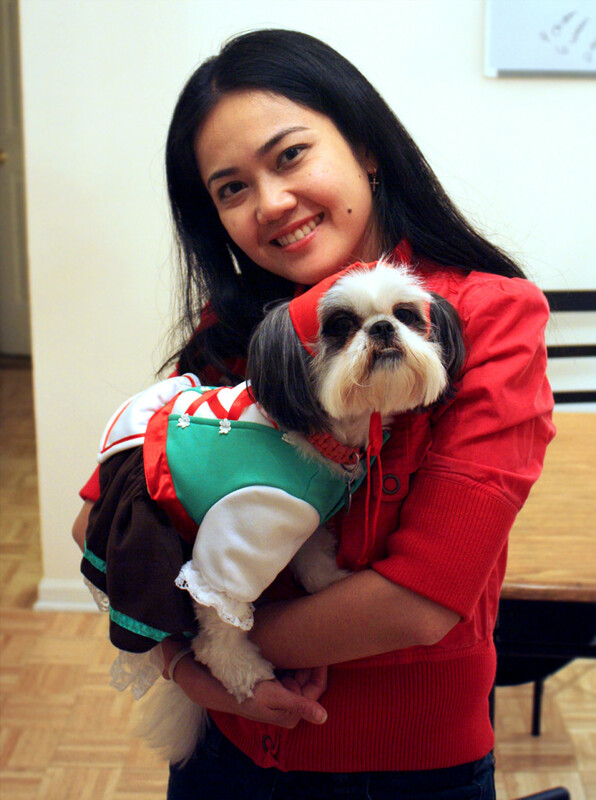 Here’s Mama and me… And the back of the costume . . . I was NOT the most excited to wear the costume, but it’s a really spiffy, well made costume. Lace on the sleeves on the dress, and another layer of ruffles underneath the skirt. Oh! And I get to wear the super cute red bandana. I am starting to perk up in this photo. I looked super chic. The red bandana was really neat, and easy to keep on. It had a cinch tie, so you just tighten it to your dog’s head. I kept it on for awhile, until I started to hate it and scratched it off.. But I was adorable wearing this costume. The costume was really easy to put on too. With lots of treats, Mama tricked me into getting my arms through the sleeves. And the outfit is kept together using velcro, making it super easy to keep in place. 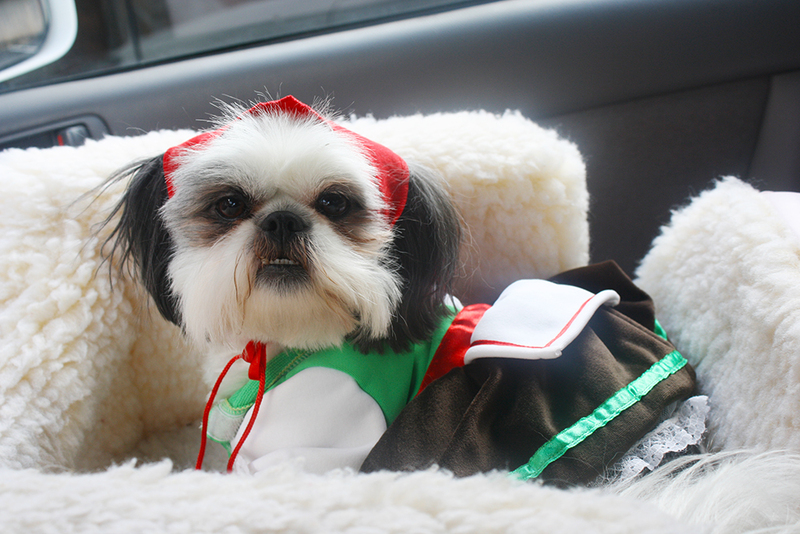 I am Shih Tzu Stylin’ in this rocking outfit. 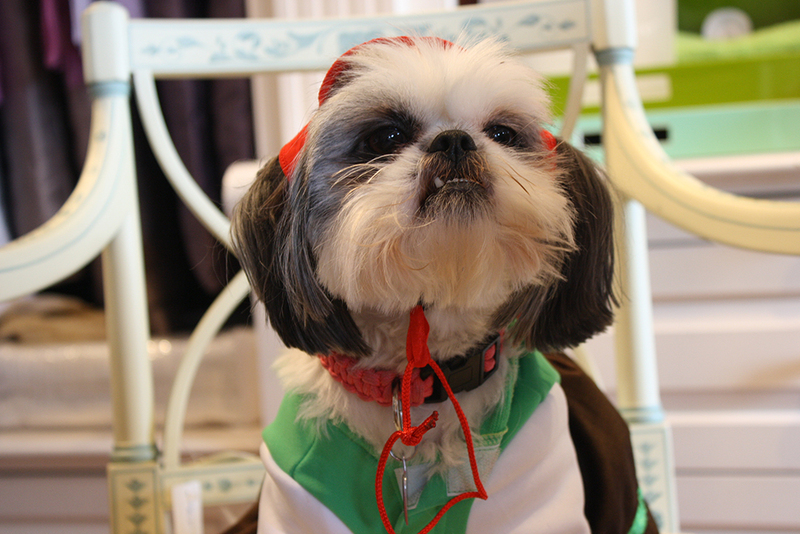 The colors – Red and Green make it a great outfit for Christmas too! It’s super cute! Look at me and my cute toofers! Oh yes, I am just so adorable! Yup, I even went to work in my little costume. Do you see the extra layer of ruffles underneath the skirt? 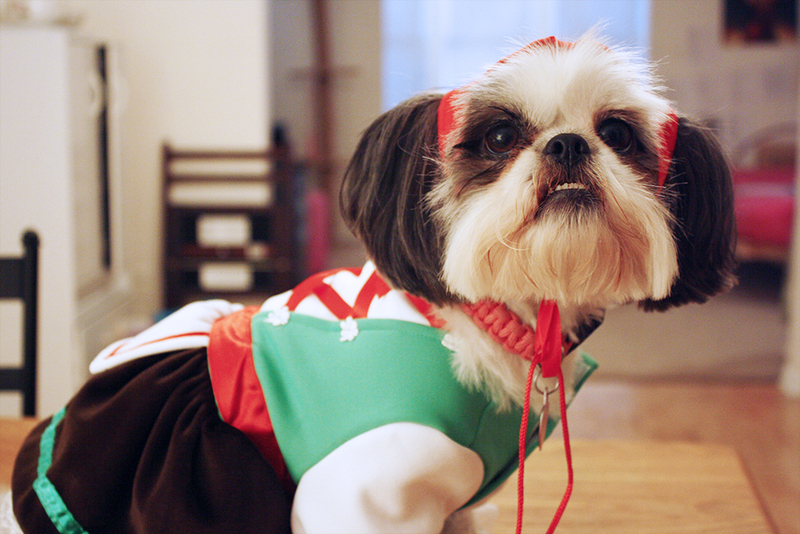 This Alpine Girl dog costume really got all the details down! Mama thought it was so funny to see me use the restroom with all those fluffy layers! Mama also really loved the red bandana. It really made this costume really pop. Mama thinks I look mean in in this photo. What do you think? Luckily, I didn’t have to wear the costume for too long. She took it off at the end of the day. And then I was free . . . free to be naked again! Well . . . until I have to wear the next two costumes – a Nurse and French Maid! Stay tuned for two more posts with my Halloween costumes! 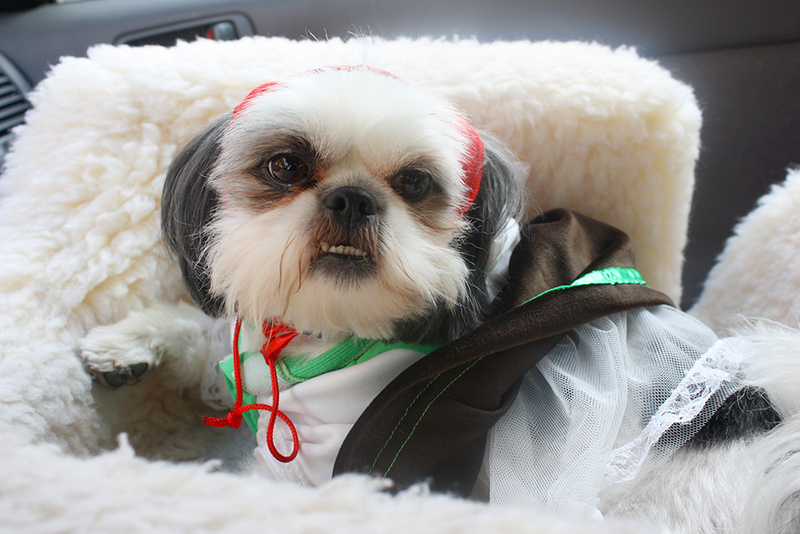 Oh my crenoline Gracie Lu, you look positively gorgeous! That really is a well made beautiful Octoberfest Swiss Mountain Girl outfit. You really make it look even more beautiful.